Have you ever found a recipe you liked, then tweaked and tweaked and tweaked it some more until it was AMAZING? That's how these shortbread cookies evolved. 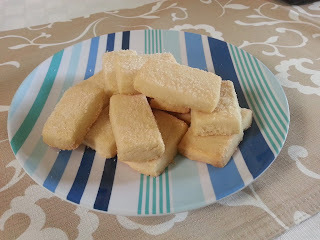 They started off as okay, but now they are buttery, flakey with a hint of almond and lemon that just makes your taste buds burst with pleasure. Fabulousness in a simple bite. 1. In a large bowl, use hand mixer to cream the butter and sugar together. Then add the vanilla, almond and lemon zest. Mix together well. Add salt, then gradually add flour while mixing on low-medium speed. The dough mixture will be dry and possibly a bit crumbly. Continue to beat until all the ingredients are well combined. 2. Use your hands to shape the dough into a ball. On a clean, floured surface, reshape the dough into a flat disk about 3 inches thick. Cover with plastic wrap, then chill for 20 minutes. 3. Preheat oven to 350 degrees. Remove the chilled dough and roll out on a floured surface until it's 1/2 inch thick. You can either cut it into fingers (pictured), circles, or use large shape cookie cutters. If cutting into fingers, I prefer to use my pizza cutter and make them about 3"x1" rectangles. 4. Place cookies on a baking sheet lined with either a Sil-Pat or parchment paper. Sprinkle the cookies with sugar, then bake for 20-25 minutes until the edges begin to brown. Let the cookies cool for 5-10 minutes before moving. Makes about 30 finger shortbread cookies.